I have a photo of Ensign Buffum with a note saying that he was “awarded Navy-Marine Corp Medal for Heroism” but it doesn’t say why. 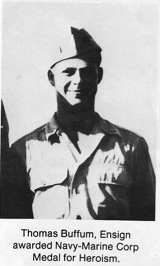 Bill Ames related that Buffum had become a true leader in the water, keeping morale up among the men after the Partridge was sunk. I’m hoping to talk to someone in Buffum’s family and find out more about the cirumstances under which he was awarded the medal. Thank you for your contribution to the survivors.